Railroad Project to Connect Iran With Turkey, Georgia, Azerbaijan - Integration Through Media ....! (VOA): The foreign ministers of Azerbaijan, Georgia, Turkey and Iran held the first-ever quadrilateral meeting in Baku to discuss regional cooperation. 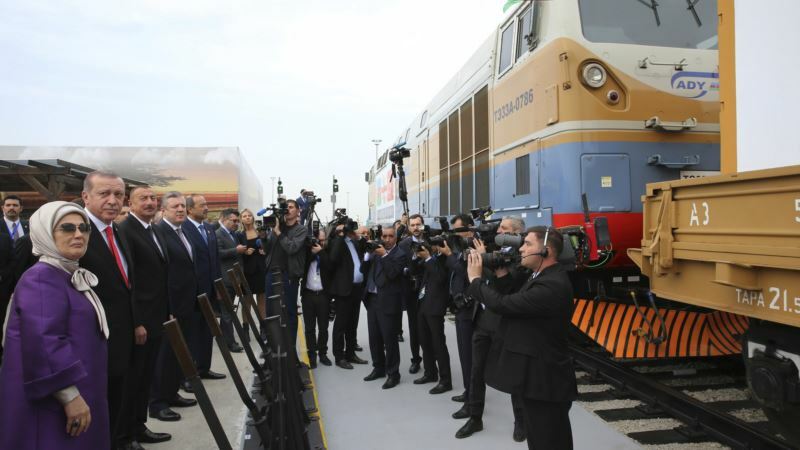 At the center of the discussions was the construction of Rasht-Astara railroad, the 180-kilometer-long rail line that will connect the Iranian and Azerbaijani cities. The project is expected to be completed in three years. “This project will herald the beginning of a new transportation corridor from the south to the west,” said Azerbaijani Foreign Minister Elmar Mammadyarov. The railroad will be connected with the already constructed Baku-Tbilisi-Kars line that links Azerbaijan, Georgia and Turkey. Turkish Foreign Minister Mevlut Cavusoglu expressed hope that the meeting of the four ministers will help boost regional cooperation, particularly the advancement of infrastructure projects in transportation and energy. “This format will allow us to increase trade, attract investment to our countries. In our next meeting, we will discuss concrete projects,” he added. According to Iranian Foreign Minister Javad Zarif, the project corresponds with the interests of the regional nations. “The new transportation corridor will bridge two continents. The new corridor serves the interests of our countries and peoples,” he said. The next meeting of the four ministers is to take place in Georgia. In their final statement, the ministers expressed support for regional peace and stability based on mutual respect for territorial integrity.